Dr. Peter Gruss served as President of the Max Planck Society from 2002-2014. Throughout his tenure, he built an international research community sharing the core values that lie at the heart of Max Planck Society’s scientific success. Dr. Gruss has also been a global ambassa- dor for basic research, using his influence to create world-changing scientific partnerships. Almost a decade ago, Dr. Gruss developed a plan for expanding the Max Planck Society, one of Germany’s most successful research organizations, into the United States. By facilitating recruitment of the world’s best scientists, creating world-class training opportunities for young neuroscientists, and elevating the profile of Max Planck Society’s research excellence here in the United States, his goals continue to be realized with great success. Today, Dr. Gruss’ vision has become MPFI’s journey. Exceptional young scientists and students come from around the world to train in the unique, enriching, and collaborative environment offered by MPFI’s Jupiter, Florida, campus. As both a scientist and a leader, Dr. Gruss continues to serve as an inspiration to the scientific community at large, especially young scientists. Establishment of the Peter Gruss Young Investigator Award was announced at a private dinner and reception at MPFI on October 26, 2015. The award will be given biennially to recognize a young investigator for significant contributions to the scientific community through collaboration, creativity, and curiosity-driven research. 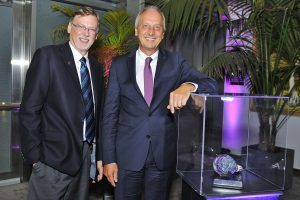 In addition to recognizing outstanding achievements, it will also help support research, inspire young scientists, promote collaboration, and acknowledge the outstanding legacy that Dr. Peter Gruss has built throughout his honorable career with the Max Planck Society. For more information on the Peter Gruss Young Investigator Award, visit here. Pictured above: Dr. David Fitzpatrick and Dr. Peter Gruss, Establishment of the Peter Gruss Young Investigator Award, October 26, 2015.